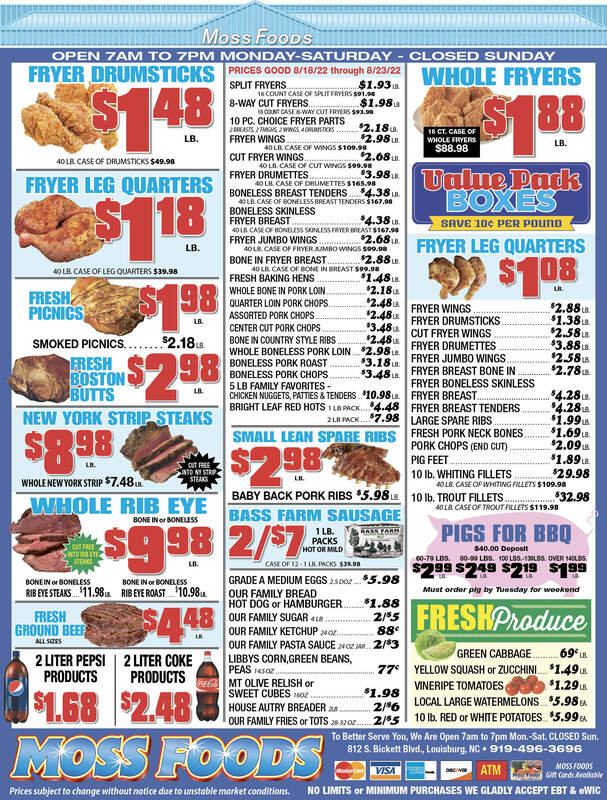 Showing 45 articles from March 26, 2013. LC ladies are national champions! EAST PEORIA, ILL. -- Louisburg College made a bit of history last Saturday by claiming its third women’s basketball national championship. The Lady Hurricanes, coached by Brett Vana, rallied in the second half to defeat Mesa Community College in the title game of the National Junior College Athletic Association Division II National Tournament on the campus of Illinois Central College. LOUISBURG — Police are looking for a suspect who robbed a town business at gunpoint. According to investigators, a man entered Franci’s Beauty Shop in Shannon Village on Bickett Boulevard just before 9 p.m. on March 22 and demanded money from a customer and the proprietor. Olivia Stritzel, 3, gets some goodies from the Easter Bunny on Saturday during the Easter Egg Hunt hosted by Friends of the Youngsville Library on Saturday. 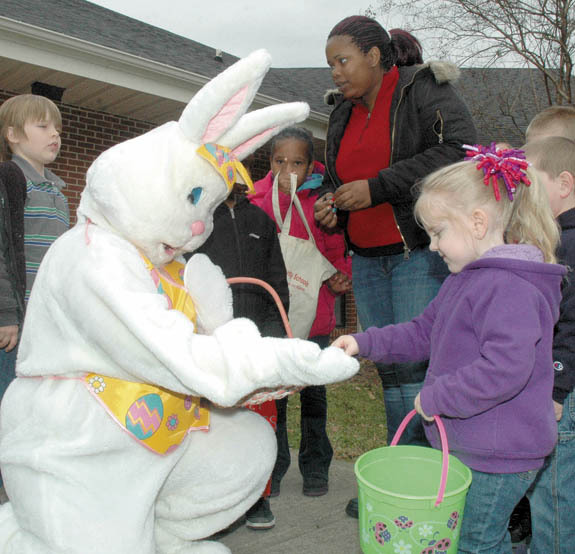 Hundreds of children and parents showed up for the event at the library, plus the Easter egg hunt hosted by the county’s Parks and Recreation department hours earlier in Franklinton. Bunn’s Fire Department is hosting a hunt at the main fire station at 10 a.m. on Saturday. It’s being billed as a “Roadshow Event” and is planned for 7 p.m. Tuesday, April 2, at the Youngsville Community House — and it’s open to the public. In essence, it’s another transportation planning meeting, this one focusing on long-term strategy for northeastern Wake and southern Franklin County. LOUISBURG — A utility man tasked with turning someone’s power off nearly got his lights shot out. Ultimately, the Progress Energy contract employee may have taken shotgun pellets to the face, but his injuries were not life-threatening. Robert E. Hodge, though, was charged with assault with a deadly weapon with intent to kill, inflicting serious injury. If this is spring-like weather, can we switch? GOOD MORNING: While bolstering missile defenses against North Korea may only intensify the antagonism, I’m curious as to what the Chinese think the U.S. response to North Korean threats to conduct a “pre-emptive nuclear attack” on South Korea and the United States as a result of stepped-up U.N. Security Council sanctions, should be? Not that it would make any difference in my response. It looks like cursive writing may get a reprieve. In a column in January, I wrote that it appeared that North Carolina teachers would no longer teach cursive writing. It would be replaced by more common core instruction and disciplines. The argument being that such handwriting is cute, but today and into the future, the skill would no longer be needed in a digital age. Grab a cup of Joe and get ready, we’re going to go through all this yet again. Regional planners are — once again, believe it or not — seeking public input as they put together a long-term transportation strategy for much of northeastern Wake and southern Franklin County. This time the project is known as the Northeast Area Study and the group wants to know how local residents would like to see this area — and the transportation options in it — develop over the next 30 years or so. Just who is going to pay for ‘free stuff’? The Affordable Health Care Act, Pete respectfully, I have to ask you, who do you think is going to pay for it? All the programs for free this and free that. They have to be paid for by someone, and my friend, guess who that someone is? It’s you. YOUNGSVILLE - Jose Manuel Perez, 41, died Wednesday, March 20, 2013 at Franklin Regional Medical Center. Services will be private. 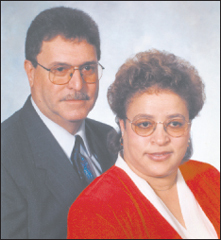 YOUNGSVILLE —Leamon Winston Catlett Sr., 65, died Saturday evening, March 23, 2013 at his home. Friends visited with the family Tuesday evening, March 26, at Bright Funeral Home & Cremation Center, Wake Forest. ZEBULON – Verna Delenia Batchelor Lewis, 86, of the Pilot Community, died Saturday, March 23, 2013 at home. Funeral service was held at 2 pm, Tuesday, March 26, at Social Plains Baptist Church with burial following in the Lewis family cemetery. FRANKLINTON— Funeral services for Minnie Perry Tice, 73, who died Saturday, March 23, 2013, will be held at 2 p.m. Thursday, March 28, at Faith Missionary Baptist Church, Louisburg. Burial will follow in the church cemetery. YOUNGSVILLE— Funeral services for Venessa Dunston Crudup, 49, who died Thursday, March 21, 2013, were held Tuesday, March 26, at Emmanuel Church of God with Bishop Allison officiating. Burial followed in the M. H. Jones cemetery. LOUISBURG - A memorial service for Irene Marion Kenlein, 90, who died Wednesday, March 20, 2013, will be held at 6 p.m. today (Wednesday, March 27) at Louisburg United Methodist Church, with Madison Hankal officiating. Visitation will be from 5:30 to 6 p.m. prior to the service. LOUISBURG - Funeral services for Beulah Mae Blackwell, 83, who died Sunday, March 24, 2013, will be held at 1 p.m. Saturday, March 30, at Hickory Grove Baptist Church, with the Rev. Bobby Thomas officiating. Burial will follow in the church cemetery. WAKE FOREST - Dorothy R. Pleasants Ray, 92, died Monday, March 25, 2013. Funeral service will be held at 2 p.m. today (Wednesday, March 27) at Mary’s Chapel Baptist Church, with the Rev. Al Thomas officiating. Burial will follow in the church cemetery. YOUNGSVILLE - Judy D. Harper died Sunday, March 24. Arrangements by Bright Funeral Home, Wake Forest. LOUISBURG – Jane Foster Pearce, 81, of Louisburg, passed away Sunday morning at her home. AWARD WINNER. 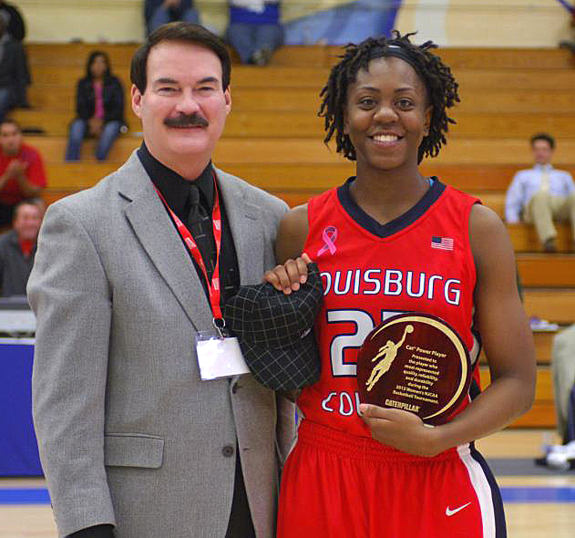 Louisburg College’s Latrice Phelps accepts the CAT Power Player Award following last Saturday night’s NJCAA Championship Game in Illinois. LOUISBURG -- Back in 1992, the Louisburg College Lady Hurricanes were on top of the junior college world after winning the NJCAA National Championship for the second time in a 12-year span. But despite many trips to the ‘Big Dance’, another title would prove to be elusive for LC -- until last Saturday night. A SLIPPERY SLOPE. Louisburg College catcher Sommer Di Fulgo (left) was unable to hold on to the ball during this tag attempt at home plate as part of last Saturday afternoon’s softball doubleheader with Spartanburg Methodist College. 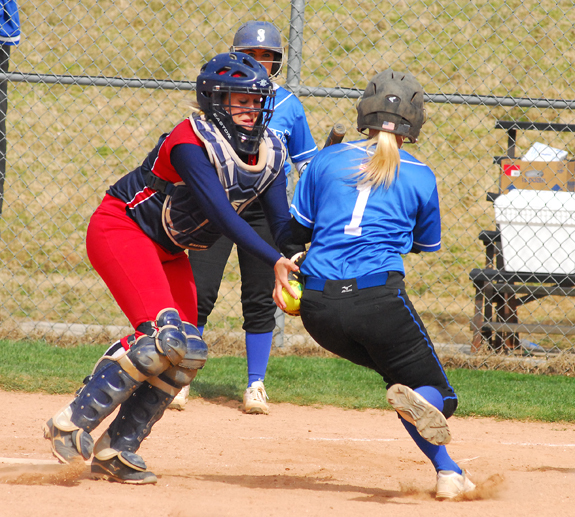 LOUISBURG -- With poor weather looming the next day, an even greater sense of urgency was put upon last Saturday’s key Region X softball doubleheader between host Louisburg College and Spartanburg Methodist College. Under league rules, games are not rescheduled after being postponed, and the weatherman was pretty sure that the area was going to get soaked by rain on Sunday. SWIPE OF SECOND FOR THE STINGERS. Louisburg College’s Zac Laneve (center) tries to come up with a throw as a Florence-Darlington runner steals second base during last Saturday afternoon’s Region X baseball doubleheader at Frazier Field. LOUISBURG -- After complaining of a headache earlier in the day, Florence-Darlington’s Stephen Dowling proved to be a pain in the neck for Louisburg College in the nightcap of last Saturday’s Region X baseball doubleheader at Frazier Field. Dowling’s solo homer in the top of the sixth inning would be the difference as the Stingers finished off a sweep of LC by a 2-1 score. BUNN -- A trio of Bunn High School basketball standouts have earned spots on the North Carolina Basketball Coaches Association All-District 6 squads. The BHS girls are represented by senior Whitney Bunn and sophomore Tainasha Vines, while the Wildcats are represented by junior guard Deshawn High. PARKER PREPARES TO POUNCE. Bunn’s Parker Brantley swings at a pitch for the Ladycats during Monday’s road matchup against host Nash Central High School. 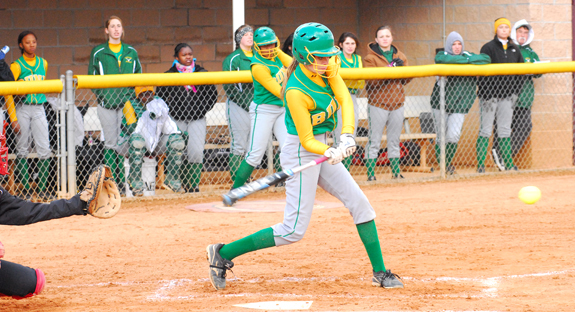 ROCKY MOUNT -- Two teams with a strong softball tradition -- both currently and in the past -- met Monday for a frigid non-league fast-pitch showdown. The contest featured a battle between host Nash Central and Bunn -- and a battle with the elements as high winds and cool temperatures meant that players from both sides were as bundled up as possible. WARRENTON -- Louisburg High School got into the winning column in Northern Carolina Conference softball action last Wednesday with a 7-6 road victory against the Warren County Lady Eagles. 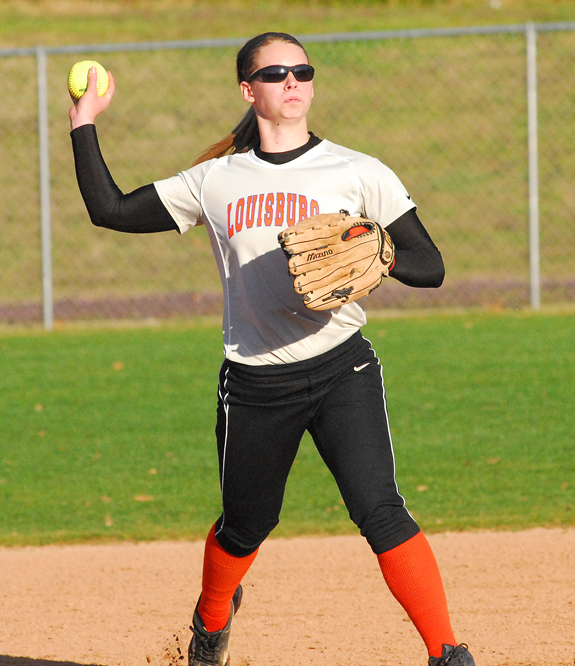 Louisburg led the whole way and rode some strong pitching from freshman hurler Sydney Parrish to the key win. DANVILLE, ILL. -- Coming into the National Junior College Athletic Association Division II Men’s Basketball National Tournament, some observers felt like the two best teams were Louisburg College and defending champion Mott Community College. But both of those clubs fell in upsets in the first round and were forced to work their respective ways out of the loser’s bracket. THE GREAT RACE. 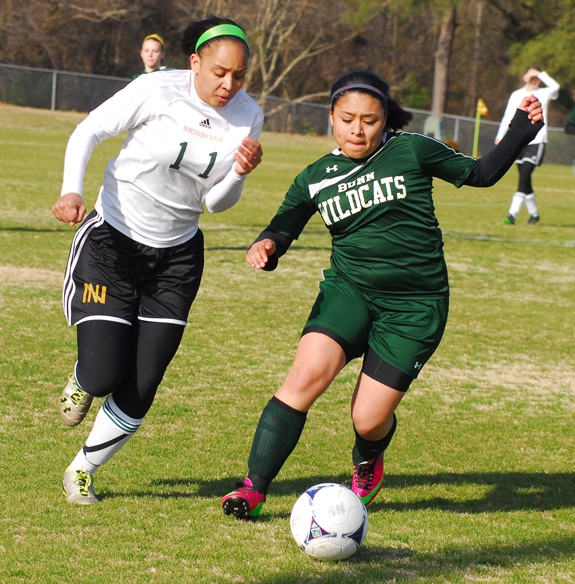 (L to R) Northern Nash’s Alexus Hill and Bunn’s Yesenia Ascencio sprint to gain possession during last Friday’s non-conference girls soccer matchup on the NNHS campus. RED OAK -- With talented forward Whitney Bunn unavailable due to her commitment to the North Carolina-South Carolina All-Star Basketball Game, Bunn High School was destined to have difficulty scoring during its non-league girls soccer showdown last Friday at Northern Nash. Just one day earlier, the Ladycats, with Bunn already in South Carolina for the hoops contest, were shut out during an overtime loss at Franklinton. MARINE CORPS LEAGUE GIFT. 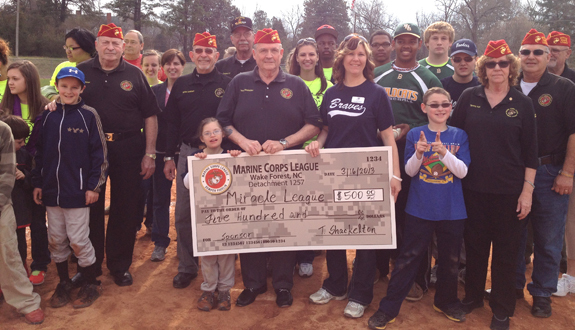 On March 16, Marine Corp League representative Commandant Terry Shackelton presented a check for $500 to Donna Wade, Executive Director, The Miracle League of Franklin County as she is surrounded by buddies, players, board members and parents at the Annual Angels in the Outfield Mini Clinic at Louisburg High School. 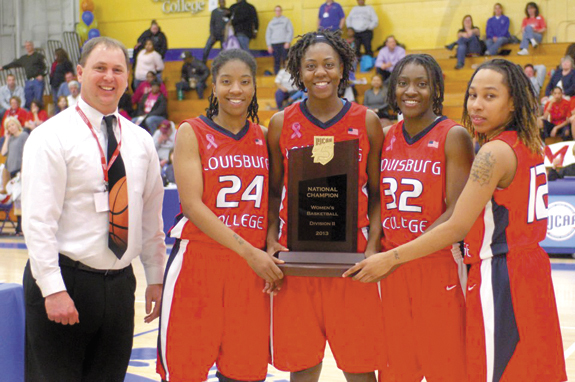 LOUISBURG -- The Louisburg College Lady ‘Canes basketball team wrapped up its 2012-13 season with a final record of 32-3 and a first-place finish at the 2013 NJCAA National Championship Tournament last Saturday. The 75-65 win against Arizona’s Mesa Community College earns the program its third national title. 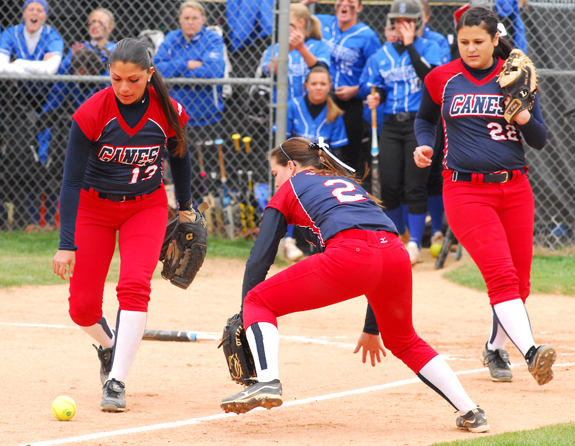 (L to R) Louisburg College softball players Angelica Fontana, Jessica Norwood and Tyler Weil are looking for this bunt to go foul, but it stayed in play for a single during last Saturday’s home doubleheader versus Spartanburg Methodist College. 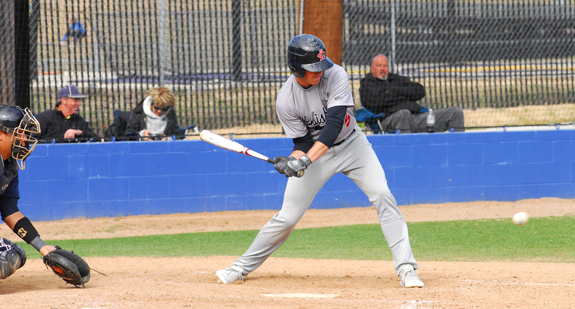 Bradley Morton continues to swing a red-hot bat for the Louisburg College baseball squad. 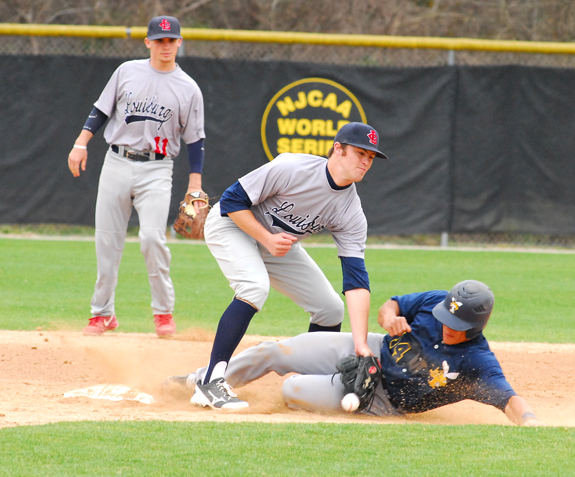 The Hurricanes will travel to Guilford Tech this weekend for a four-game series. 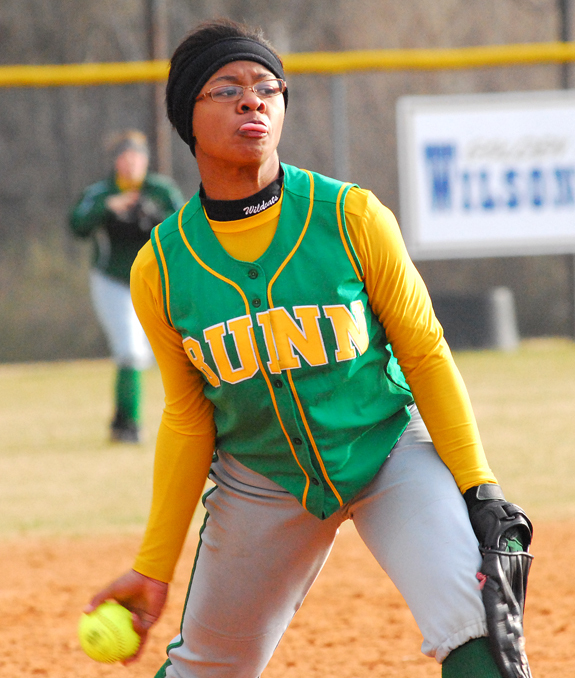 Freshman Erica Davis saw duty on the hill Monday for the Bunn Ladycats during their road softball matchup against the Nash Central Lady Bulldogs. 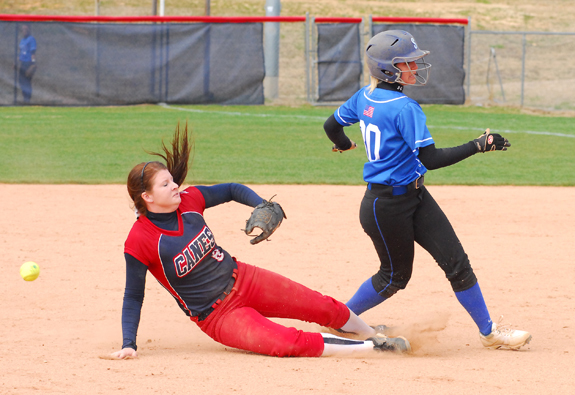 Louisburg College shortstop Morgan Tharrington (left) is interfered with by a Spartanburg Methodist College baserunner while attempting to field a ground ball during last Saturday afternoon’s Region X doubleheader at Sheilah R. Cotten Field. 45 YEARS. Duray and Susie Coley of Louisburg celebrated their 45th Wedding Anniversary on Thursday, March 21. They were married on March 21, 1968. They are the parents of Terry and Timothy Coley and the grandparents of Perrie, T.J., Xavier and Alex Coley. LOUISBURG — Two Youngsville businessmen have a new date to petition a county board for approval to operate a gun range on their property. The county’s Board of Adjustment had planned to hold a special public hearing this past Monday to hear Eric Coombs and Aaron Byrd argue that they should be able to invite friends, gun club members and others to a Dunn Road property to shoot at targets on the 170-plus acre property. Franklin County sheriff’s deputies and Louisburg police combined to stop a woman suspected of stealing beer from the Citgo gas station on Bickett Boulevard. 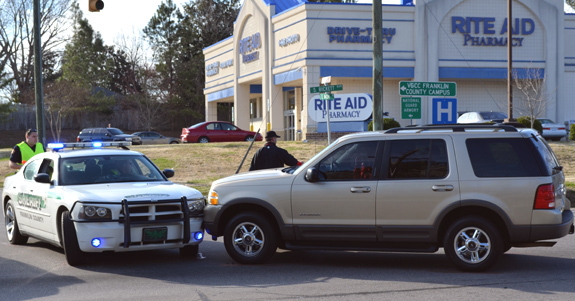 A deputy used his cruiser to forcibly stop the fleeing sport utility vehicle. Officers charged Chelsie House from Royale with the theft. Passengers were also served with warrants from Henderson. LOUISBURG — A man authorities allege caused a near riot during an Hispanic girl’s birthday party late last year appeared in court Monday. But it won’t be the last time that Gregory Vidal, shackled and dressed in jailhouse gray, will stand before a judge. Army National Guard Pfc. Arabia Alston-Bannister has graduated from basic combat training at Fort Jackson, Columbia, S.C.
A man who nearly caused a Louisburg police officer to wreck found himself in trouble with the law. According to a report by Officer T.W. Lincoln, he was on patrol the afternoon of March 22 when a 1997 Buick LeSabre abruptly pulled out from a driveway, forcing him to slam on brakes. The driver, later identified as Stanley Davis, then backed into the driveway. Lincoln continued on, pulling off to the side of the road. EASTER RUSH. 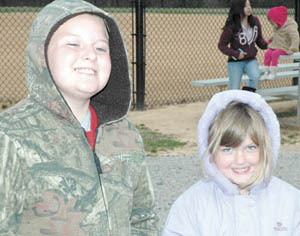 Fun was had by all at Easter egg hunts held in Franklinton and Youngsville this past Saturday. 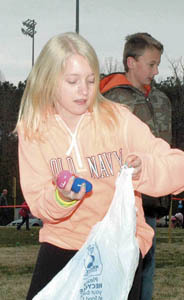 Above, Olivia Damron races for eggs. EASTER RUSH. Fun was had by all at Easter egg hunts held in Franklinton and Youngsville this past Saturday. 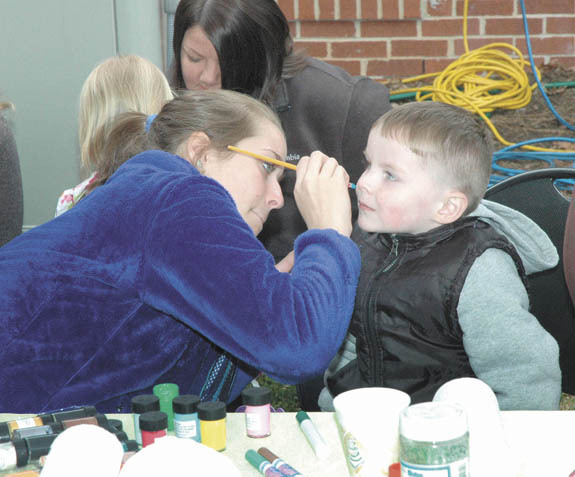 Above, Cierra Killian paints Trevor Rooks’ face. EASTER RUSH. 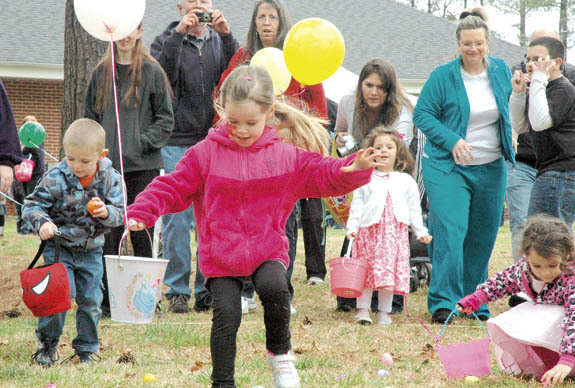 Fun was had by all at Easter egg hunts held in Franklinton and Youngsville this past Saturday. 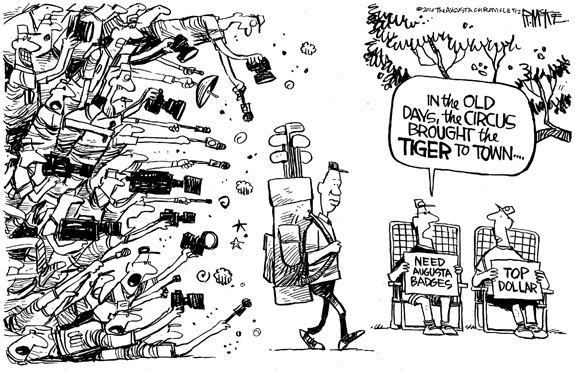 Left, Ashley Woods gets off to a good start collecting eggs.